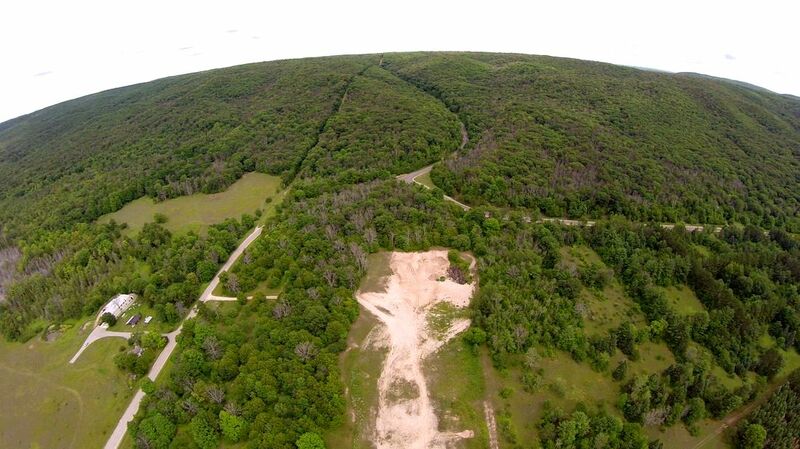 The aerial view photo of Chandler Hill below, taken by Charles Dawley on 30 July 2014, is oriented the same direction as the photo above. The farm is the same in both photos as having first belonged to the Martin/Roscoe Howard Family and presently owned by Art and Connie Keyes. The electric power line is visible cutting straight up the over the hill in both photos. In the photo below the Chandler Hill Road curves up over the hill, while Slashing Road heads off to the right going toward Thumb Lake Road. The trees planted in the square grid pattern on the right are the planting remains from when the Tree Nursery was located there on Slashing Road, where several Chandler Township residents worked. "As you may have noticed, we do not have any sponsor organization. That is because our committee is made up of all the people in our community. Our township has no school, church, town, post office, grocery store, philanthropic organization, industry, or any organized group that could fund our activities. All we have are our people, all 125 including the children. We have a local form of government that is backing us completely. 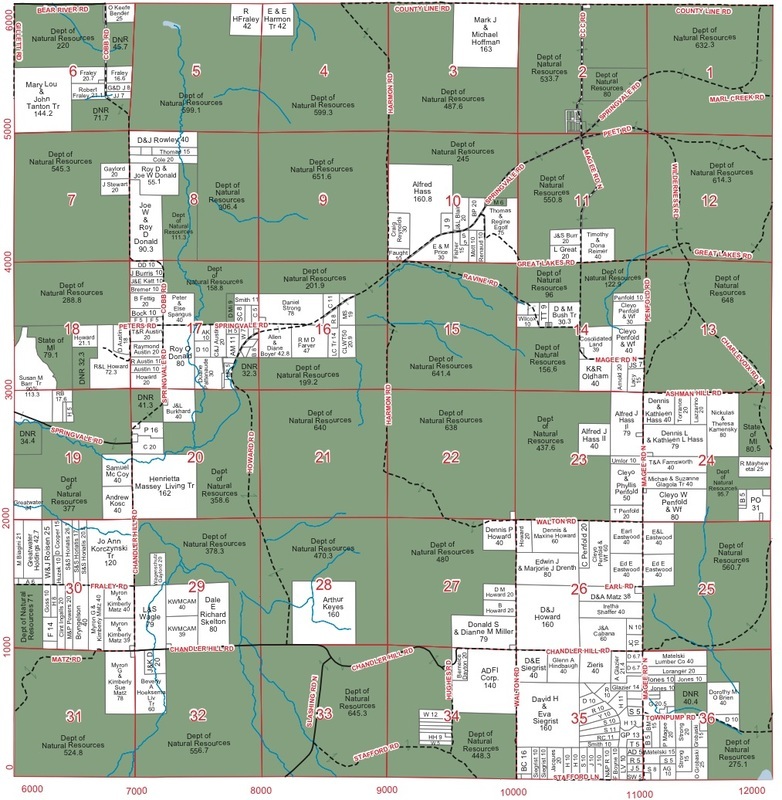 We are a low economic area with a very low tax base, since about 70% of our land is owned by the state [The green colored land in the above Chandler Township Map is all state owned land]. Chandler Township was at the heart of the logging industry. Now we have only 1/4 mile of paved road, but our voting record has been over 70% for years. As you can imagine since we are in northern Michigan our area is beautiful and rural. In fact, the only town [Springvale] we ever had was built in 1900 by a logging company and was completely run by them. The town was never incorporated. When the logging company pulled out in 1925 they tore the town down leaving only the foundations. This was no little town either; it had a 16 room hotel and a store that a newspaper article quoted as 'doing $100,000-a-year' business. What we're trying to express is that even though we are small we feel our Heritage Day, our projects, our people and our way of life so completely correspond with all three themes of the ARBA that should not be over-looked. Our township picnic is probably most characteristic of what we're talking about. It will be the old fashioned picnic where everyone contributes something; it reflects a life-style that was typical of our forefathers and yet, it is not unlike our life-style today in Chandler Township; all the people working for all the people. We hope to carry on this theme in annual picnics in the future. Whatever mark we make on the Bicentennial will be made by the efforts of everyone in our township. By the time our Heritage Day arrives, as many people in Michigan and everywhere else as we can reach with our story, are going to come and take part in the pride we hold for our township and our country." 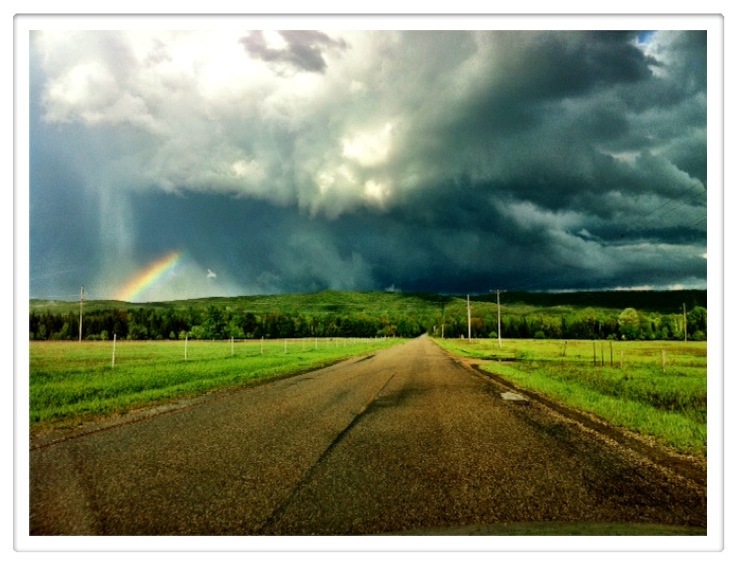 "I took this [photo above] on the way to the farm! It was one of the coolest things I have ever seen! I sat in my car on the side of the road for a long time, just watching. I think someone upstairs was sending me a sign that maybe even in the eye of the storm a rainbow can exist." 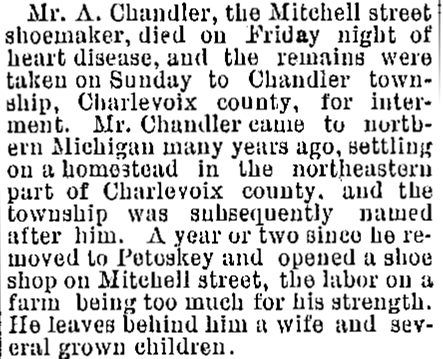 The 1891 newspaper article gives an explanation for the naming of Chandler Township. Arthur Chandler was buried in the Gallop Cemetery of Chandler Township. Chandler is a surname... derived from the occupation of someone who makes or sells candles and/or soap, paint and groceries... from the French "chandelier". All photos on this website were taken by, or are in the collection of, Karla Howard Buckmaster, unless otherwise noted. The design and compilation of the text and photos on this site are copyrighted 2013. Please remember this website will continue to be a work in progress. I am open to making additions, or changes to any information, or photos. so do feel free to contact me regarding absolutely any of your concerns having to do with this website. if you found enjoyment in viewing this site with a topic so dear to my heart. https://chandlertownshipmichiganmemories.weebly.com was created, and provides this site only from a love of local history and genealogical interest.